Flammable and hazardous chemicals cause major fires and injuries every year in industrial applications. Similarly, the military also uses large quantities of these materials and is subject to the same risks as other industrial applications. One of the main chemicals used in the maintenance of military equipment as a cleaning solvent and degreaser is isopropyl alcohol, also called isopropanol. With a flashpoint of 53 F, this solvent is very flammable and NFPA categorizes it as Class IB. OSHA places it in Category II. To maintain fleet readiness and mission preparedness, military units need critical support chemicals on hand in local flammable liquid storage facilities. Due to the variety and volume of chemicals required, it is important to follow NFPA and OSHA codes. NFPA 30 and OSHA 1910.106 regulations cover flammable liquid storage requirements. They specify segregated storage for flammable liquids. Storage buildings must meet fire-rating criteria, based on their location. Always refer to the chemicals’ Safety Data Sheets (SDS) to determine chemical properties for storage. Even some flammables may be incompatible and need to be stored separately. A naval base experienced an explosion due to a mixture of nitric acid and isopropyl alcohol. Intermodal containers (also known as ISO containers or Conex boxes) are used in the military for transport and equipment storage. But, these buildings do not meet NPFA requirements for chemical storage. Intermodal containers do not have controlled venting to remove flammable vapors, and are vulnerable to corrosion and leaks. Conex containers do not have integral secondary containment sumps and can allow flammable chemicals to spread into the environment. Most importantly, they do not meet FM and UL approval standards since they are refurbished shipping containers. These precautionary measures before opening the door will help ensure the safest working environment for all personnel and maintain the integrity of your mission critical storage facility. Experts at U.S. Chemical Storage manufacture prefabricated flammable chemical storage buildings. 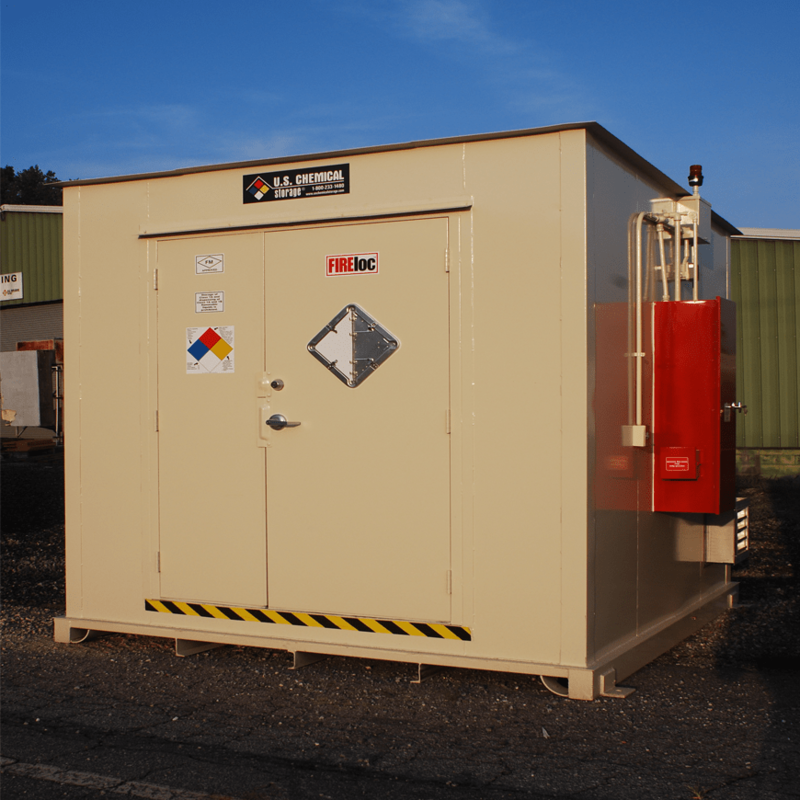 The SUPERloc range of buildings is 4-hour fire rated and has a setback restriction within 10 feet or less of an existing building. The FIREloc is a 2-hour fire rated model and has a setback restriction between 10 and 30 feet of an existing building. Buildings located more than 30 feet away do not require a fire rating. All of our buildings have built-in secondary containment sumps along with other NFPA 30 requirements for storing flammables. U.S. Chemical Storage specializes in code compliant chemical storage buildings customized to your specific mission critical chemical storage requirements. We design custom chemical storage buildings to meet NFPA, EPA and OSHA requirements, allowing you to focus on mission preparedness. Find out more at our website and browse our product range here or contact us.